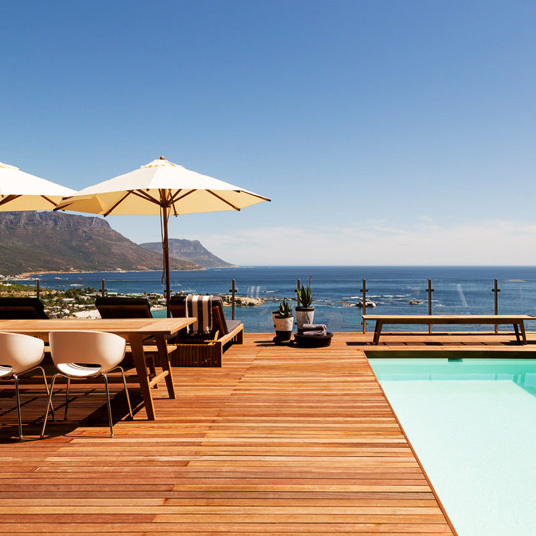 It’s hard to even accept the possibility of the sort of person who wouldn’t be satisfied with Cape View Clifton, a relentlessly tasteful five-suite bungalow nestled into the cliffs on one of the world’s most spectacular coastlines, just outside of Cape Town proper. The whole place feels like it’s made of ocean breezes and ocean views, so light is the decorator’s touch, while the vibe is somewhere between the just-out-the-oven homeyness of an upscale bed and breakfast and the wine-by-the-pool languor of a private beach house. Everything at the hotel is oriented toward the Atlantic. Even the perfectly inviting pool is really just a pretense for soaking in the views, the sun-loungers at its side pointed feet-first toward the ocean. And in the suites, walls of glass bring the outside in — a common enough ploy, but much more significant when what’s outside is a scene like this one, with manse-flecked mountains rising from the boulder-strewn beaches below, and a line of high, craggy ridges stretching out toward the horizon to the south. The topography calls to mind Australia’s Great Ocean Road, or the wilder stretches of California’s Pacific Coast Highway, only here the sublime is tinged with sophistication. Camps Bay, with its upscale shops and inviting restaurants, is just down the road, and the scene in those little coves down by the water is about as civilized as fun in the sun can be. Should the crowds become too much, however, you can always head back uphill to the intimacy of the hotel — whether to have a snack and a chat with a fellow guest at the long communal table, or to wash off the salt water in privacy, in your suite’s deep white-marble tub.